Nolan is using Smore newsletters to spread the word online. Kingdom Animalia - The bodies of most animals ( excluding sponges ) are made up of cells organzied into tissues specialized for specific functions. In most tissues are organized into even more specialized organs. Most animals are capable of complex and relatively rapid movement compared to plants and other organisms. Most reproduce Sexually by means of different eggs and sperm. Most animals are diploid meaning that the cells of adults contain two copys of the genetic material. Phylum Chordata - Chordates are organisms that possess a notochord its a rod that extends most of the length of the body when its an adult. They usually have bony or cartilaginos endoskeleton. they have Complete digestive systems. Sub-phylum Vertabrata - Vertebrates, which include fishes, reptiles, amphibians, birds, and mammals, they all share a vertbral column, or a chain bony elements ( vertebrae ) that runs along the head to the tail and form the main skeletal structure of the body. Movements provided by muscles attached to there skeleton. they're bony or cartilaginous endoskeleton consisting of cranium, visceral archers, limb girdless, and 2 pairs of appendages. Mammals can very in size from 3 Gram bats and blue whales that weight 160,000. Many species of mammals have evolved to live in nearly every habitat on the planets fromland masses to aquatic habitats on the planet. Many specis are arboreal which means spending lots of time in the forest canopys. Order Carnivora - Carnivores habitat just about every type of terrestrial habitat and many aquatic habittats as well from the tropics to the poles. Most members of the order carnivora can be notice by their enlarged fourth upper premolar and first lower molar which together form a strong shear to cut meat and tendon. These teeth are referred to as the carnassial pair. The exceptions are a few forms, such as bears, raccoons and seals, where these teeth are secondarily modified. Carnivores tend to be medium-sized animals; too small they couldnt find anything to prey on; too large they wouldnt be able to feed themselves. However, as a group carnivores span wide range of body sizes. Least weasels, the smallest of all carnivores can weight as little as 35 grams and male southern elephant seals the largest carnivores can weight moore than 3,600 kg. Many carnivore species are sexually dimorphic in size. Usually males are larger than females ( as with fishers lions and wolves ) but in a few species females are larger than males ( spotted hyenas ). Additionally, malesof some species have ornamentation that females lack. 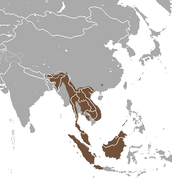 Family-Viverridae - This family is native to southern europe, africa and asia. Viverrids are medium-sized ccarnivores with long bodies and short legs. Their bodies range from 300 mm in length ( excluding tail) to be 1000mm in length Weights vary from less than 1kg to 14kg. Most species have relatively small heads with short pointed erect ears and a long pointed muzzle. They have retractable claws most have perianal glands that produce a strong smelling substance in some species that odor is sufficiently potent to ward of predators. 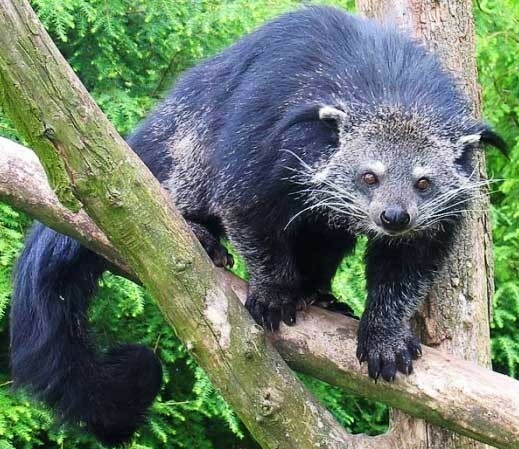 The Northern species of binturong have a thicker coat. The Binturongs teeth are not designed for cutting up flesh these carnivores have more rounded and and smaller teeth used for eating fruits. The adult species of binturong use their tail more as a brake than anything, attatching it to a branch and sliding down the tree trunk. 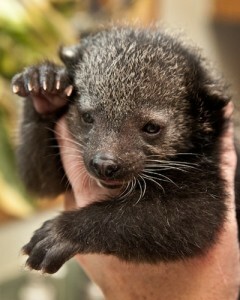 While young binturongs use their tail to support their weight when climbing. Burton, M. (2002). 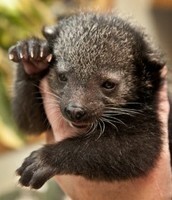 Binturong. In International wildlife encyclopedia (3rd ed., Vol. 2, pp. 201-202). New York, NY, USA: Marshall Cavendish.